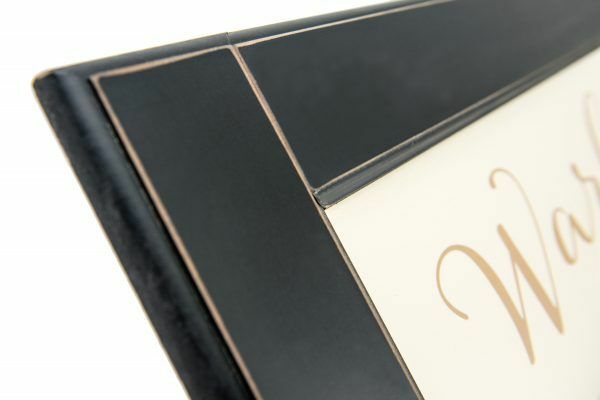 This framed family name sign is framed in a beautifully crafted black frame. Customize with a family surname and established year in the color of your choice. Wood family name sign measures 13″ x 30″ and is finished with a keyhole slot so that it is ready to hang on the wall. This framed family name sign is designed with a simple and classic design. It is one of our original established signs and is a very popular style. Framed family name sign features a family name and established year in the color of your choice. It is also framed in a high quality wood frame that measures 13”x30” and comes ready to hang right out of the box. We make our signs to last a lifetime so we never use vinyl stickers on our signs. This sign makes a fantastic personalized wedding gift or anniversary gift.